Let’s go back in time. Gentlemen, here’s your fedora and coat. Ladies, here’s your cloche hat and flapper dress. Tonight, we’re going to watch a show at the theatre, and afterwards… let’s go dancing. Of course, if we want to go dancing, we’ll need a place to dance! Jazz music was peaking, and wood-floored ballrooms were an ideal place to unwind. Some ballrooms would even take on a non-segregation stance, which was very uncommon for the time. Of these, there is one outstanding name that has a place in every swing dancer’s heart. The Savoy! However, there are numerous historically significant ballrooms around America. Let’s look at a couple of them! Back in the 20s, Chicago was the place to be for jazz music; New York’s scene was still growing. It wouldn’t be until later, when Duke Ellington starts moving the center of jazz from Chicago to New York that it would fully flesh out its swing music scene. It was during this time that famed ballroom owner and dance promoter Jay Faggen was asked to run a ballroom in Chicago. He named it Savoy, after the New York ballroom he has opened a year prior. Like the New York Savoy, it played a host to many dancers, famous artists and bands aplenty, and it was also the birthplace of the Harlem Globetrotters! This ballroom was serious about the space it provided for its customers, It had a parking lot for 1,000 cars, had capacity for over 4,000 dancers, and its cloakroom had space for 6,000 hats and coats to hand individually! The ballroom itself had half an acre of sprung wooden floor for dancing. That’s half a football field of dance floor! Artists that played at the Savoy Chicago included the likes of Count Basie, Duke Ellington, Louis Armstrong, Ella Fitzgerald and Gene Krupa. During its peak, 1927 to 1940, the ballroom was open every day. It even featured 2 house bands that would take turns playing so the dancing would never have to stop. Unfortunately, the Savoy Ballroom is no longer with us. It was closed in the summer of 1948 and eventually demolished in the early 1970s. The Roseland was the NY Savoy’s precursor. 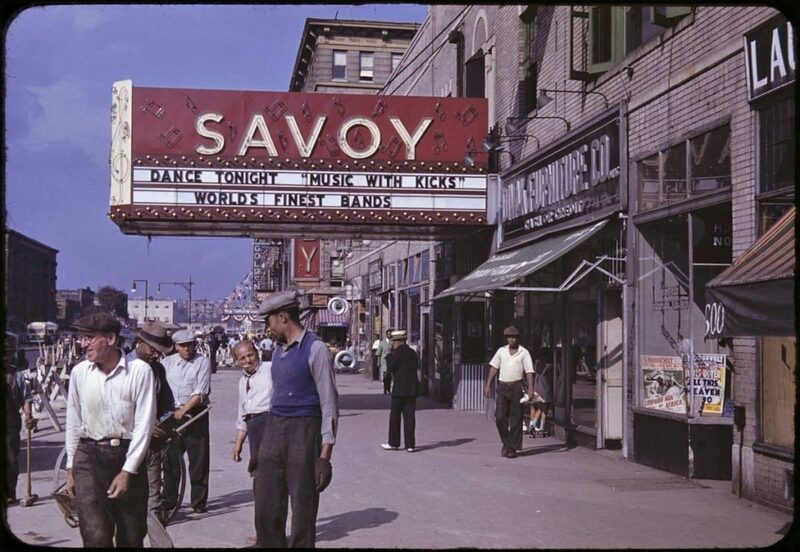 It was also co-founded by I. Jay Faggen, who modeled the Savoy Ballroom after the Roseland. The Roseland was opened in 1917, but moved to a new location in 1919, and then again in 1956. Roseland finally closed its doors in 2014. Unlike the later Savoy Ballroom, Roseland was mainly for white swing dancers. However, as hot jazz become more popular, more and more African-American performers started playing at the Roseland. Aside from Tommy Dorsey and Glenn Miller, Roseland also featured Louis Armstrong, Chick Webb and Fletcher Henderson. In 1999, Frankie Manning celebrated his 85th birthday with a dance at the Roseland. In typical Frankie style, he danced with 85 follows for Shiny Stockings, as performed by the Count Basie Orchestra. It took him over 9 minutes of dancing to get through 85 follows! The Roseland eventually closed down in 2014. The last artist to perform there was Lady Gaga, who did a 7 day residency.